Congressional Sportsmen’s Caucus Members gathered with representatives from the wildlife and sporting community to discuss the importance of reauthorizing the conservation programs within H.R. 2, the Agriculture and Nutrition Act of 2018 – more commonly referred to as the Farm Bill. 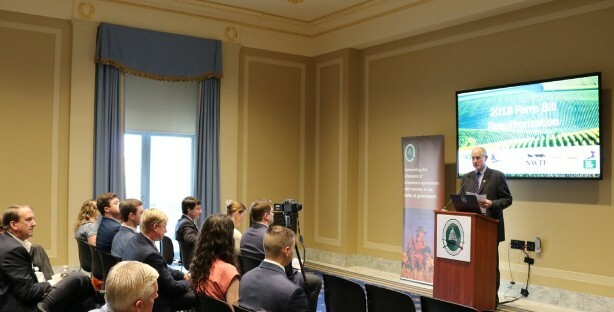 Hosted by the Congressional Sportsmen’s Foundation (CSF) and partners, this Capitol Hill Breakfast Briefing served as a platform to highlight several Farm Bill conservation programs and discuss their impact to our nation’s outdoor heritage with Members of Congress and Congressional staff. Congressional Sportsmen’s Caucus (CSC) Vice-Chair Congressman Austin Scott (GA) welcomed attendees and thanked sponsors and briefing speakers for their support. If signed into law, the Conservation Title within the new Farm Bill will ensure the future of critical programs that support hunting access as well as soil, water, and fish and wildlife conservation on private lands, farms, ranches, and forests across the United States. In April, the House Agriculture Committee passed the Farm Bill reauthorization, which now awaits a vote on the House floor.